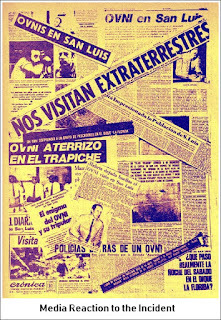 One of the most significant UFO events of the Republic of Argentina took place on 4 February 1978, when several competent witnesses witness the descent of a strange craft and the presence of a tall humanoid who left his prints on the ground. The research undertaken after this event determined its reality, and corroborated the footprints left behind by the occupant. 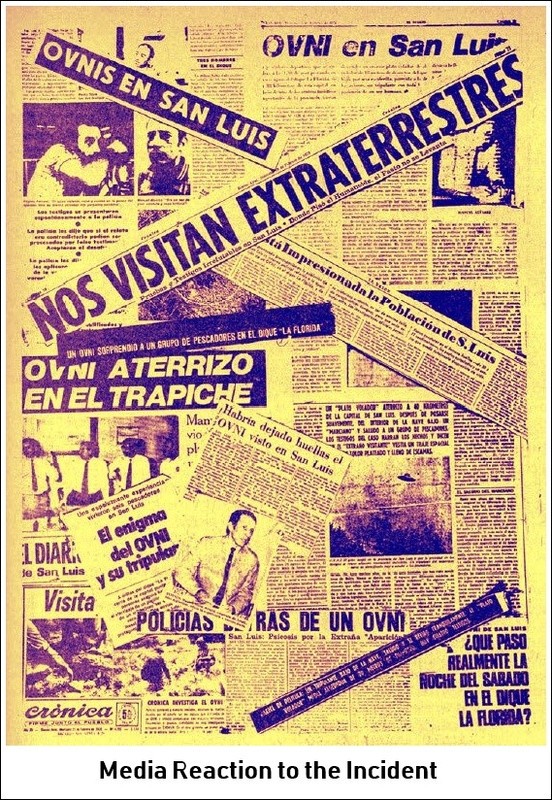 This incident – known around the world as the Dique La Florida Case, in San Luis, Argentina, was supported by the investigative facilities of the Provincial Police of San Luis, headed at the time by Lt. Col. Raul Benjamin Lopez, who signed off on the first official report on a “walkabout” by a UFO occupant, representing both the Provincial Police and the Argentinean Army. Location: La Florida Nautical and Fishing Club, Lake La Florida , 38 km from the city of San Luis, Province of San Luis, Argentina. Witnesses: Manuel Maria Alvarez, Paraguayan, naturalized Argentinean with 5 years residence, single, age 32, employed with Aerolineas Argentinas; Regino Salvador Perroni, Argentinean, 26, married, employed by Banco San Luis; Pedro Raul Sosa, Argentinean, 32, married, employed by the Government House of the Province of San Luis; Ramon Armando Sosa (brother of the preceding), Argentinean, married, 39, employed at the San José ceramic works; Genaro Luis Sosa (brother of the preceding), Argentinean, married, 34, employed by Banco Provincia de San Luis; Jacinto Eduardo Lucero, Argentinean, married, 24, employed by Banco Provincia de San Luis. Researchers: CAEFA Team, including Betina Allen (psychoanalyst), Hugo Quiroga (CAEFA, San Luis), Beatriz Balboni (biorhythms expert), Alberto Radaelli (identikit of the object and entity), Prof. Fabio Zerpa (research, interrogation, psychological analysis and supervision). On the night of the event, Genaro and Pedro Sosa, along with Regino Perroni and Jacinto Lucero, had gone to buy meat for a cookout. They went to the Mede butcher shop in the city of San Luis, where they purchased 3.5 kilos of meat and sausages (chorizo and morcilla), enough for the six friends who wanted to go fishing at Lake La Florida. They always fish together at various locations in the region. The six men are “fishing buddies” even though their families do not socialize. Perroni and Lucero are in-laws (the second is married to Perroni’s sister). They live together in the Cantisan district near Genaro and Pedro Sosa’s home. The four men boarded Genaro Sosa’s Fiat 125 and went off to find Ramón Sosa, who lives at 105 Calle Mitre, and finally picked up Manuel Maria Alvarez around 11:00 pm. They drove along Route 20, exchanging very few words. They looked at the lovely starlit sky and the landscape of the area, darkened by decorated by the lights in the sky. They reached the La Florida Nautical and Fishing Club, 38 kilomters distant from the city. When they arrived, the fire prepared by Rodriguez, the club stewart, was nearly ready, as he had done some empanadas earlier. Alvarez, the Paraguayan, stared to prepare the roast, having learned to do so in his adopted country, as he came from Paraguay to Argentina when he was 5 years old, becoming a naturalized citizen. The other five men helped their friend, talking, swapping remarks, telling jokes. The roast was ready within an hour and a half. The six men consume a scant liter of wine between them. None of them likes alcohol. Between 12:30 and one in the morning on Saturday, 4 February 1978, the men were in the lake fishing. With Perroni’s boat holding the six protagonists and their fishing tackle, they headed into the lake’s waters. They wanted to go south, rowing with a northerly wind, at a depth of 50 meters. The waves are considerable, and when they reached an inlet on the other side of the Fishing Club, they decided to return to the lake to fish with “more peace”. They began fishing at around 2:10 am. The men had boarded another boat belonging to a friend. The fish were not biting, so bored and tired from a long week’s work, Genaro and Ramón Sosa, along with Jacinto Lucero, went to sleep some 5 meters from the boat’s deck at 3:30 a.m., leaving Alvarez and Pedro Sosa leaning against the railings. These two are avid fishermen, long-time friends, and always fish together. Perroni was somewhat farther behind the other two, standing next to the boat’s engine, speaking softly “so as not to scare the fish”. He sees the three friends getting ready to sleep, covering themselves with coats, as it was a cold evening (14-16 degrees C). The three fishermen who remained awake struggled against the denizens of the water, retrieving two Silversides and eight carp. At 4:15 am, Perroni saw “something” flying in front of the moon. Genaro woke up at his friend’s exclamation. Both thought it was a shooting star, like countless ones they had seen so often, but nonetheless striking. After exchanging a few words, Genaro Sosa went back to sleep, covering himself well, as he felt very cold. Alvarez and Pedro Sosa remained at their stations, fishing. At 4:45 am, an intense light appeared behind the vessel, emanating from a small hill some 20 meters distant. It was strong enough to make Perroni cover his face, and make the three sleeping men wake up. 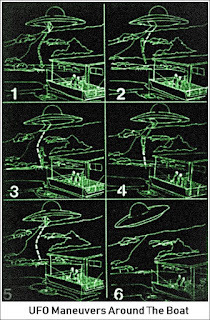 Alvarez and Pedro Sosa turned around to face an unusual event: They were illuminated by a powerful light, seeing it was an unidentified flying object – a metallic, solid device shaped like an upside-down saucer, projecting white light from its undersection and emerald green and red lights from its upper fuselage. It was suspended in mid-air over the sloping terrain leading to the water, some 3 meters over the ground, measuring some 15 meters in diameter. The object let down a small ladder (similar to that on a Fokker aircraft) and a humanoid form descended. It stood between 2-2.10 meters, wore a shiny, silvery, form-fitting uniform. The “man” wore a transparent helmet over his head, making visible his blonde hair and fine features. At no time did the witnesses see the entity’s feet, and were unsure as to any footgear. 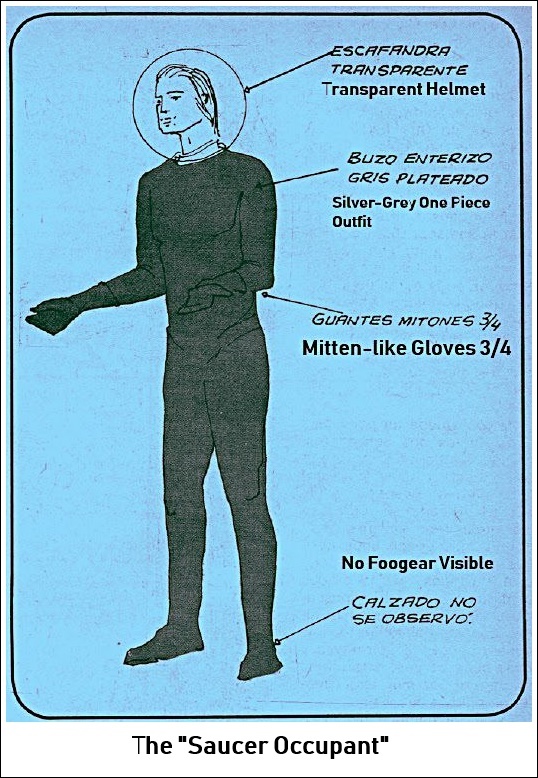 The entity’s identikit photo matches all descriptions provided. After descending the ladder, the entity walked over the terrain (or glided over it, not sure), which sloped downward and approached the edge of the lake, a scant 15 meters away from the fishermen. With as mile, the stranger placed his gloved hands (encased in what appeared to be mittens) in front of him, palms upward, in a characteristic friendship gesture and a yoga position (lotus flower). A universal gesture of giving. Following this gesture, the being turned on a heel and headed for the ladder. He climbed and re-entered the craft. The ladder retracted, and the opening that allowed it to descend to earth closed up. After 20-30 seconds, the vehicle rose into the air and vanished into the mountains of San Luis toward the northeast. Pedro Sosa, shocked by what he was seeing, saw much less of the humanoid than did Alvarez, who is the most descriptive of the witnesses. Regarding the object, the witnesses differ on its luminous characteristics, but all agree on the powerful light behind them. To Genaro Sosa, the object had a yellowish aura. Ramon Sosa believes it was a fluorescent light. Pedro Sosa thinks it had various colors rotating around it. Jacinto Lucero remembers it as a very bright white light. To Alvarez and Sosa, the object left a luminous wake in its path. All agree on the circular shape. The three sleeping fishermen were shaken out of their slumber by the event. The other three described it as an inverted soup bowl with a sort of aileron or ring in the middle, which left a luminous wake in its path as it sped away, forming a white halo around it as it vanished toward the San Luis mountains. 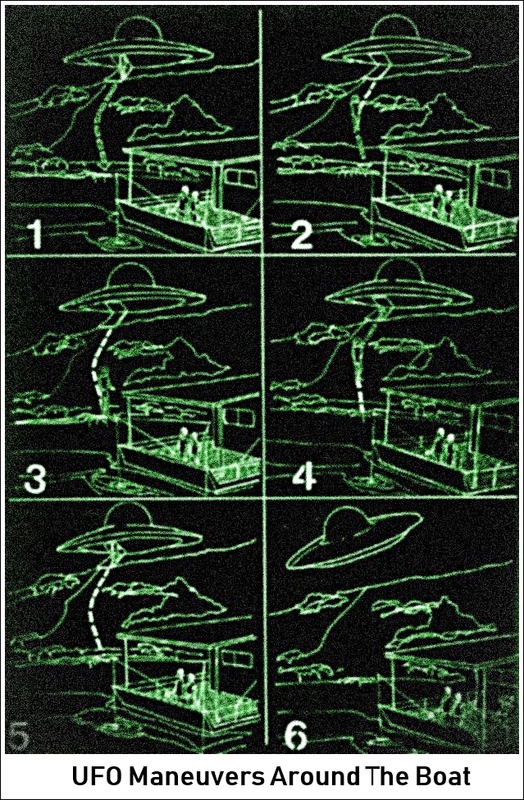 All six men agree that the UFO, at a 45 degree angle to the horizon, made a half-loop before vanishing. 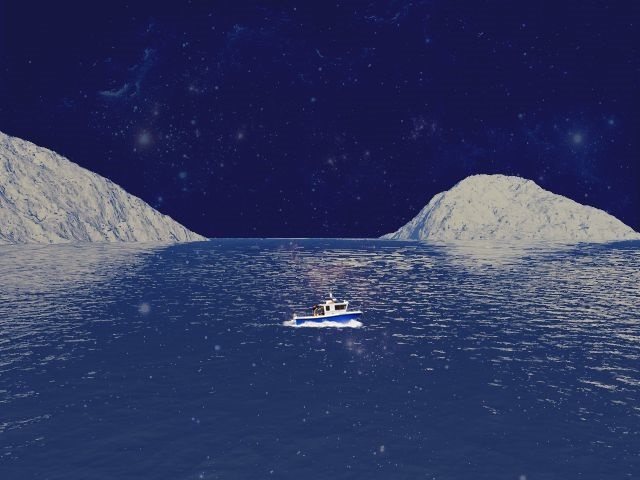 It did not vanish from sight; rather it disappeared altogether, leaving behind a luminous white circle that widened gradually before going away. This remark gave us pause. Was it a time-travel opening? An opening to other dimensions? A sudden intrusion into the mountains of the area? Questions that were to be meditated upon. It was all over. The six men on the boat exchanged startled looks. All thought it was a flying saucer. 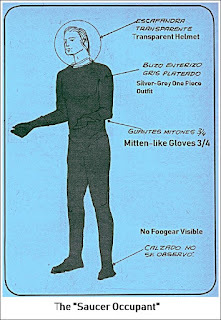 When we suggested it might be a secret terrestrial craft, flown by an unknown astronaut, they looked at us quizzically. All of them firmly believe they saw the anomalous event we come to describe as "UFO".